Home / Years / 2013 / Steyn picks up both poles, a win and a 2nd place finish at Road Atlanta Double majors tour showcase event! 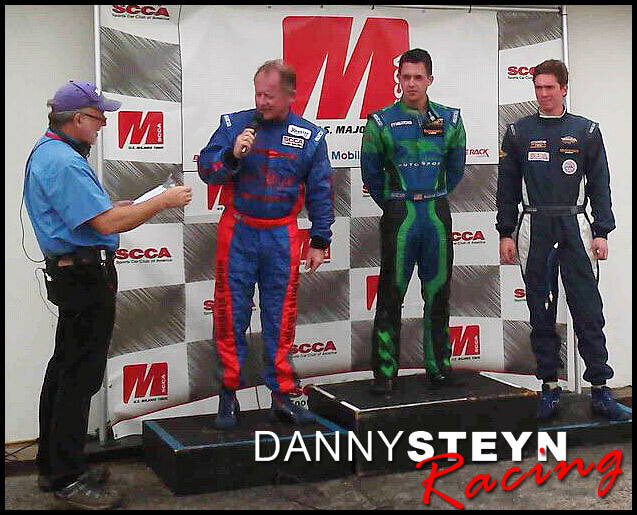 Steyn picks up both poles, a win and a 2nd place finish at Road Atlanta Double majors tour showcase event! Steyn’s 2013 season continued in fine fashion with Steyn nailing down four poles! Steyn got both STL, one ProIT pole and one Spec Miata pole that was under the existing Spec Miata Road Atlanta lap record. The field included four Spec Miata National Champions, Jim Drago, Steve Gorriaran, Yiannis Tsounis, and Todd Lamb. In Race 1 Danny Steyn and Jim Drago had an epic battle. Steyn and Drago worked together to gap the field, and Steyn led every lap except the last lap, when Drago got by to edge Steyn by 12/100ths on the final lap. Fellow Rossini powered driver Andrew Carbonell finished third. In Race 2 Carbonell got to the front, with Yiannis Tsounis, Stefan Tisseront, Jim Drago and Steve Gorriaran and Steyn in close contention. There were several changes for position, but eventually Carbonell and Steyn broke away from the group behind. On the last lap Carbonell was able to draft by Steyn for the win with Dillon MacHavern in 3rd. Andrew Carbonell makes the last lap pass on Danny Steyn at the Road Atlanta Double Majors Race 2! Road Atlanta SCCA Majors Podium Spec Miata Race 2 – Carbonell 1st, Steyn 2nd and MacHavern in 3rd. Steyn’s in car camera showing the great race over the last two laps between Carbonell and Steyn! Steyn qualifies on pole for 2013 June Sprints and gets taken out while leading the last lap. 85 Spec Miata’s compete at COTA in SCCA Majors BFG Super Tour!